The first part of WTOP's three-part series "The making of Marion Barry" looks at how the future mayor got his start in the civil rights movement before coming to D.C.
WASHINGTON — Seemingly every successful political campaign says it ran a different kind of campaign. But Marion Barry’s first campaign for mayor of D.C., which reached its ultimate goal 40 years ago this week, reflected a change in how the District governed itself and saw itself. Barry wasn’t D.C.’s first black mayor, nor was he the first mayor the District’s voters picked for themselves under home rule. His predecessor, Walter Washington, held both of those distinctions. But Barry’s election, made virtually certain when he unseated Washington and vaulted over Council Chairman Sterling Tucker in the September Democratic primary, was both a cause and a result of the District coming into full flower as an independent and black-run city. “Marion Barry really is known, not as the first mayor, but [as] the one who stepped out,” Gray added. “Marion’s election was a breath of fresh air,” said Absalom Jordan, a member of the Advisory Neighborhood Commission for Ward 8, who knew Barry for decades. Not by much: In the three-way primary race, Barry won by only 1,356 votes over Tucker and 2,979 over Washington. But he was on the way; he won the general election with 70 percent of the vote over black Republican Arthur Fletcher. He would win the next two mayoral elections, in 1982 and 1986, as well. Barry had only lived in the District 13 years when he was elected, and he didn’t seem like the mayoral type when he arrived: “The champion of the street dudes” is how fellow activist Courtland Cox remembered him — a dashiki-wearing orator who spoke casually of the possibility of getting “beat to death” by the police and who was arrested multiple times in D.C. But Barry could move between “the suites and the streets,” as veteran reporter Tom Sherwood described it, to create the signature jobs program Pride Inc., which created jobs for at-risk youth and ex-offenders. He eventually put on a suit, ran for the School Board and the D.C. Council and in both places talked about holding the line on taxes. In the process, he demonstrated an acuity for the budget process that might have surprised those who didn’t know he was a dissertation short of a Ph.D. Observers say he demonstrated what the activism of the 1960s could move into as the decade changed. Barry’s method of campaigning was heavily influenced by his work in the civil rights movement, and it was likely the only way to get past two heavily favored candidates. In the process, he built a very different coalition than had come before: heavy support from white voters in Wards 2 and 3, and from a gay and lesbian community that he energized politically for the first time in city history. That was a voter base very different from the one he relied on later in his career, in the process laying the groundwork for the personal affection people had for him that carried through the difficulties he got himself into. The popular image of Barry is dominated by his legal troubles, and not without reason. He was convicted of drug possession in 1990, assault in 2000 and tax avoidance in 2005, and crack was discovered in his car in 2002. But he remained politically viable through it all, returning to the mayor’s office after his drug conviction in 1994, and to the D.C. Council in 1992 and 2004. To understand the District of Columbia, one must understand Marion Barry. Barry had at least two political rebirths in his career, depending on how you’re counting, and a lot of people outside the District — and inside — saw them as cult-of-personality triumphs by a hopelessly corrupt leader with the help of the followers he’d bought off or mystified. 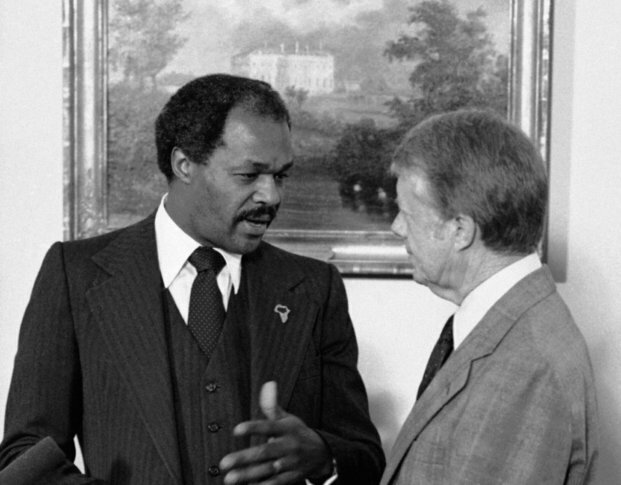 But “To understand the District of Columbia,” The Washington Post once wrote, “one must understand Marion Barry.” And a look at the election of 1978 goes a long way to explaining the bond the mayor had with the city, which lasted until his death in 2014. Marion Barry was born in Itta Bena, Mississippi, about 15 miles from Greenwood, in 1936. He told the Oral History Project of McComb (Mississippi) High School in 2011 that his parents were sharecroppers and they lived in a shotgun house with no electricity or indoor plumbing. Before he was old enough to go to school, his mother would take him into the fields while she worked. Then, Barry went to a one-room schoolhouse with one teacher for 40 kids. “I don’t remember learning very much,” he said. Mainly, he would watch the Greyhound bus go by on the way to Chicago, and wish “we were on that bus, getting the hell out of there.” He noticed early on that white students got to ride a school bus, but he had to walk. In 1958, as a senior at LeMoyne-Owen College, the NAACP (of which Barry was LeMoyne chapter president) sued Memphis over segregated seating on the city buses. A white man on the LeMoyne board “said some negative things about black folks in his argument to the court,” remarks Barry found “condescending,” he told the McComb students. He wrote to the president of the college asking for the board member to resign or apologize. Eventually, the letter was published on the front page of the Memphis Commercial Appeal. He wasn’t dismissed — the president “thought it was better to get rid of me,” Barry wrote later. He graduated, and in 1960, he was working on a master’s in chemistry at Fisk University when he helped found the Student Nonviolent Coordinating Committee and, as its first chairman, began spending more and more time at sit-ins, marches and demonstrations, including some of the first sit-ins at lunch counters in Memphis. He continued his activism when he began working on a Ph.D. in chemistry, first from Kansas University and then from the University of Tennessee. What use was getting an education if you couldn’t get a job, or vote, teach where you wanted to teach, or live where you wanted to live? Students, he explained in his book, had the most to gain from civil rights: “What use was getting an education if you couldn’t get a job, or vote, teach where you wanted to teach, or live where you wanted to live?” Eventually, his civil rights work took over from his academics, and Barry devoted himself to the movement full-time. He completed all his doctorate course work but never wrote his dissertation. Soon he was sent back to Mississippi — to McComb, city in the south of the state of about 12,000 located 30 miles south of Jackson and 180 miles south of Itta Bena, to organize. One of the organization’s trademark methods, Barry remembered, was for members to stay in the houses of local families. That gave them the kind of connection that could come in handy in the face of a backlash from white local police, and also formed a bond of understanding. That way of creating a bond would come in handy when his political career began. Barry worked with SNCC in New York for a few months before being sent to D.C. in 1965. He was dispatched “to raise funds, not hell,” Milton Coleman wrote in The Washington Post decades later. But, that didn’t last long.